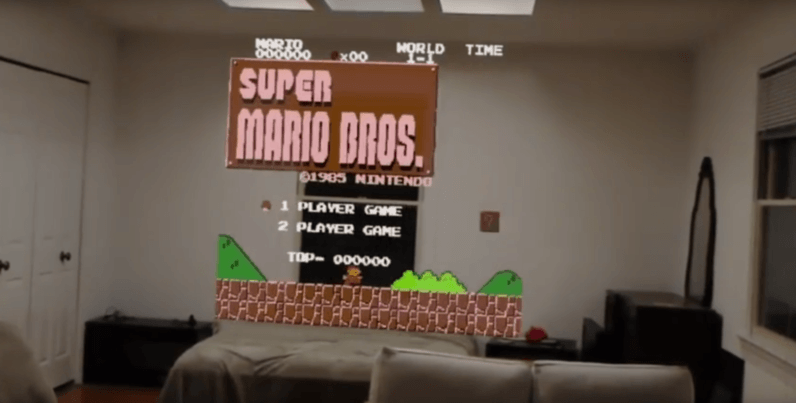 We’ve already seen how cool playing Pokémon Go on HoloLens looks, but have you ever wondered what it’d be like to play Super Mario, The Legend of Zelda II, Donkey Kong and a bunch of other oldschool games in mixed reality? Thanks to independent developer Andrew Peterson and his N3S Emulator, now you can find out for yourself. In a new video demonstration, Peterson showcases what it’s like to play Super Mario and a few other retro games on HoloLens. To make this possible, the crafty developer uses a custom-built NES emulator that converts two-dimensional objects to 3D and renders them in mixed reality in real time. The N3S Emulator places the characters straight in your living room, allowing you to play games while keeping focus on your surroundings – and the experience is equally awesome and surreal. Unfortunately, Peterson’s creation is still in its alpha version so you’d have to wait a little longer before you can test it out for yourself. However, you can still compile the simulator from its source code (available on GitHub). As Peterson points out, HoloLens won’t run most games at full speed and some games won’t even boot. You can find out more about how the N3S emulator works here and here.